1950s: An evening class is formed by Worcester City Education Authority playing a wide range of music and performing with distinction at Music Festivals in Cheltenham and Hereford. Peter Brockway is Conductor with Arthur Bancroft as leader. 1960s: Still under the control of the Education Authority, the Orchestra begins to operate more independently and is instrumental in raising funds towards the building of the Swan Theatre in Worcester where a seat was endowed. 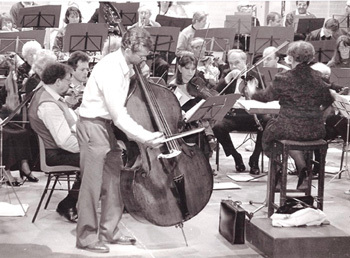 1972: The Education Authority decide not to offer an orchestral class and the membership independently re-launch as an Orchestral Society at a public meeting on 27th September 1972, becoming Worcester Concert Orchestra. Sheet music used by the former evening class is donated to the new Society by the Education Authority and Arthur Benoy, Worcestershire County Music Advisor, who had guided the formation of the new Society, becomes the first President. Trumpeter, Ian Pattison, is elected as Chairman, a role he will hold for 40 years! 1974: John Taylerson from the brass section succeeds Peter Brockway as conductor. He works to continue the Orchestra’s development broadens the repertoire. 1977: Bella Holt becomes Leader upon Arthur Bancroft’s retirement. 1980: Eric Holt becomes conductor and together, the husband and wife team guide the orchestra for the next four years. To encourage young people to attend concerts, Eric hit upon the idea of afternoon concerts to be held for the first time, in the Swan Theatre, and to launch a Young Conductor Competition. 1984: Joan Best becomes Conductor and Eric Holt is appointed President following the death of founder President, Arthur Benoy. 1988: Bella Holt retires, succeeded by Sylvia Morris. 1989: Karl Hepplewhite becomes leader. 1996: Members adopt a new constitution and change the orchestra’s title to Worcester Philharmonic Orchestra with an aim to encourage young soloists to perform concerti through membership of Making Music’s Young Artist’s Scheme, and other charity agencies. 1997: Dr William Boughton becomes President upon the retirement of Eric Holt. 1998: Joan Best retires after 14 years as a conductor and is succeeded by David Curtis as principal conductor, with Tommy Pearson as guest conductor. 2000: David Curtis retires and is succeeded by Neil Aston. 2002: Actress Patricia Shakesby accepts an invitation to become a Vice President. 2003: Karl Hepplewhite retires as leader, succeeded by Graham Longfils who still holds this position today, as well as that of assistant conductor. 2012: Ian Pattison is appointed a Vice-President on retiring from the role of Chairman after 40 years. Vice-Chairman Paul Leinthall-Cowman, a member since 1981, is appointed Chairman. 2015: William Boughton retires as President of the Orchestra, replaced by international pianist Mark Bebbington. 2017: Founding member and cellist Janet Jarvis is appointed as Vice President following the death of Ian Pattison. The June 2018 concert is dedicated to Ian’s memory. 2019: The orchestra seek a new conductor to continue the work of Neil Aston, presenting concerts to an ever growing audience who appreciate the unrivalled experience of live music.